Episode 2 ends with a bambo jungle scene where Hae Soo being held as hostage by 4th Prince Wong So. The 8th Prince Wong Woo release her by saying she is all innocent she has nothing to do with this situation. As Hae So was the bold and intelligent girl she told them that there was another group fighting and killing people. The 4th & the 8th prince search and found no traces of the dead. But luckily the 8th Prince Wong Woo happen to find blood at the bambo's and conclude that it was all planned and they killed themselves. How clever the 8th Prince was. He beautifully release Hae So and caught on the fight. Hae Soo was too scared he told Prince Wang Woo that the 4th Prince told that man to kill me, he always wanted to kill me whenever he see me, What if he really kills me. She had too much fear of 4th Prince Wang So and never step a back to say what she wanted to. 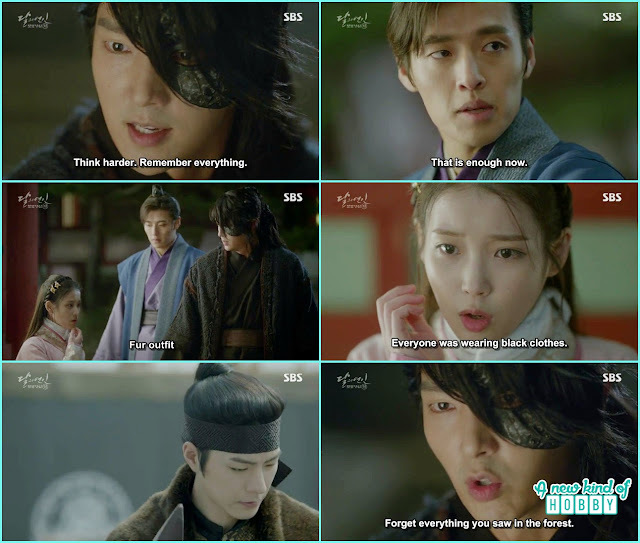 Yeon Hwa help 4th Prince Wang So with the medical aid and shows how much she cares for him in fact she had fallen for him. Seriously we don't like and couldn't stand her being near the 4th Prince. Ever body was worried for Hae Soo specially Princess Myung Hee but thanks she wasn't badly injured just a cut on her neck. Her maid put the medicine. It was relief the wound wasn't too deep. Myung Hee thanked the 8th Prince for saving Hae So's life. 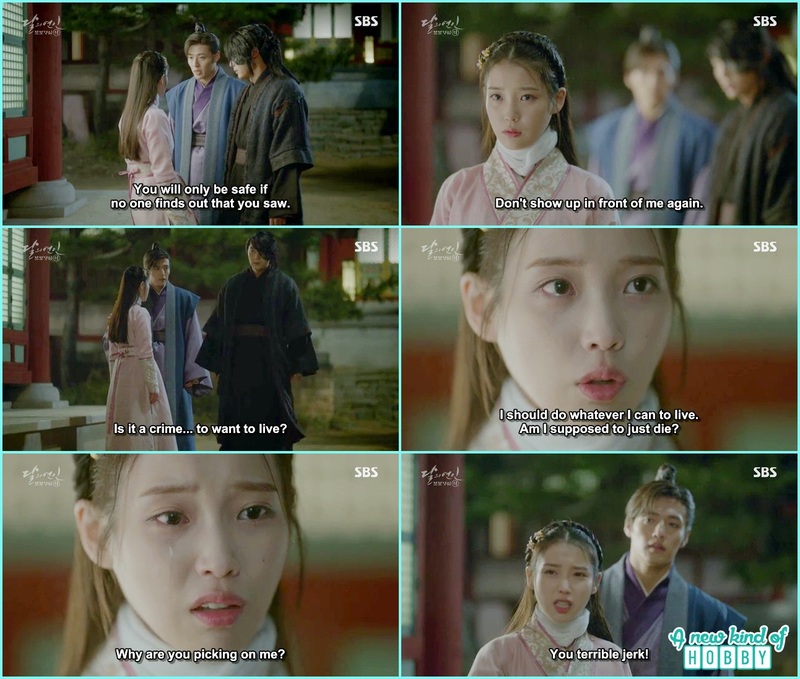 On the way back to her room Hae Soo encountered the 8th Prince who was angry for loosing the assassin as Hae So interrupted in. If he could that person he have known who was behind all this. He was too annoyed he grab Hae Soo's face in anger and ask think harder and remember anything you missed. The 8th Prince came like an angel to save Hae Soo again. Suddenly Hae So remember something regarding the other group fight he mention. One of the man who was looking unique his face was covered he was wearing a fur outfit and was ordering the other who were wearing the black outfit. The 4th Prince now come to knew it was Wang Yu. He was the eldest brother of Prince Wang So. Lastly the 4th Prince didn't forget to mention Hae Soo to forget everything she saw in the forest. My sister laugh saying its really hard to remember things and he is ordering her to forget everything. The 8th Prince interrupted its enough let her go. This put a lot of fire on 4th Prince attitude. He again said "Don't ever show up infront of me again ". It was the end of Hae So's patience. She burst is it a crime that i want to live, what's the reason you are picking on me you terrible jerk. This scene shows Hae So has the ability to stand infront of 4th Prince attitude. Wang Eun the youngest Prince told Hae So that he saved her from the punishment, what if he didn't plead infront of the majesty she would have severly being punished for making a Prince face like that. Hae So was So was grateful and thanked him for saving her from receiving the punishment. In the end the youngest Prince tell her that she is the one who treated her like that. He never got beaten by anyone through out his life so he enjoyed getting beaten up by Hae So. Listening this Hae So replied you are welcome when ever you want to get beat or want to fight, you can always come tome. Te younger brother of Prince Wang Wook (Baek A) was an artist . He love drawing and use to draw sketches of the people. This remind us of many dramas specially "the painter of the wind", "The Maids" and "Love in the moonlight". At the market place ion the town he draw the sketches of people. On the way back he happen to saw Prince Wang Jung (Ji Soo) who was fighting with the people and challenging them. Both of the Prince disguise themselves and fulfil their hobby coming to the town between local peoples. It was another touching scene both kept each other secret but Wang Jung took the Wang Baek sketch book and ran when he knew that he draw his fight scene. 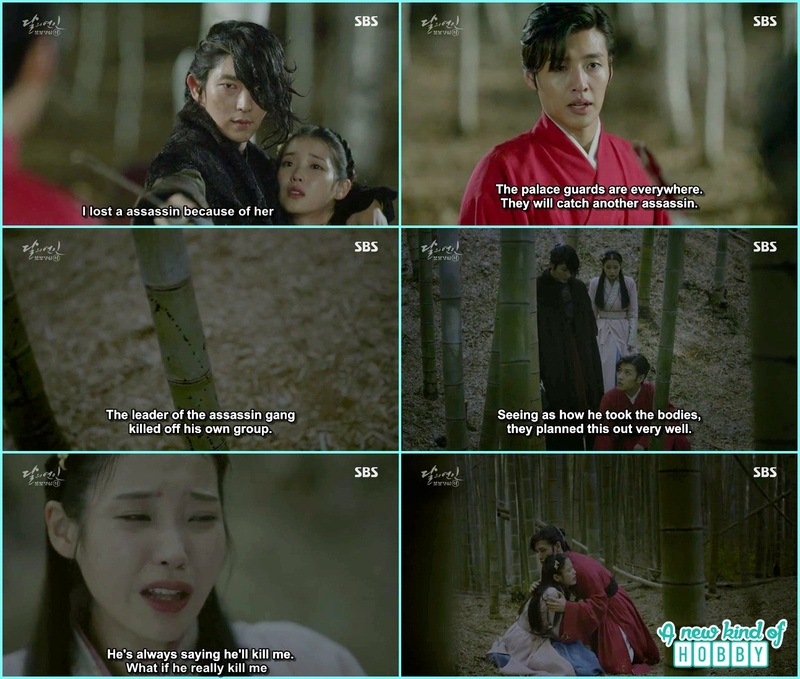 Wang Wook (Baek A) was also too close with Prince Myung Hee who was his cousin and sister in law. He cares her a lot as the double of the relationship. Hae Soo was talking to herself and repeating the words of Yeon Hwa actually she was mimicking her. Prince Wang Wook (Baek A) and Princess Myung Hee saw her and they both wish for her memory to return soon and praise her that she become more warmer and wise than before. 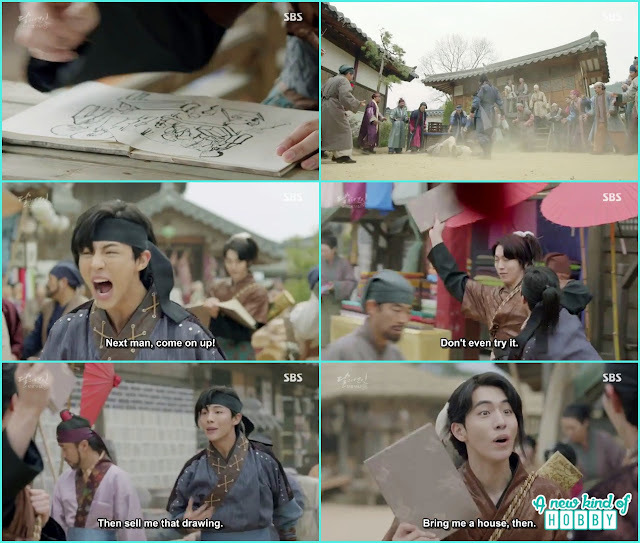 It was a scene at the local market place where the 8th Prince Wang Wook and Princess Myung hee along with Hae Soo giving free food to the people. After completing their work Hae So went to the medicine store to buy some products and happen to encounter Prince Wang Wook. He was worried for her and bought her the medicine for the wound on her neck. This scene shows he takes extra interest in Hae So and cares for her a lot. The fourth Prince Wang So (Lee Joon Gi) didn't stay still as he has the nature to dig in deeper to find the truth once he take interest in. He even didn't hesitate to kill people. Same goes here he finally trace down the place from where the people attacked at lantern festival in the palace. It was a horrible action scene when he fought with the people all alone and end up killing every one when he didn't find the truth. It comes out all the people who live here can't speak, their tongues cut off and this temple is under the care of Queen Yoo. All this was told to him by the monk. He along us surprised that actually it was Queen Yoo's planning. He after killing the people came to the palace in Queen Yoo's quarter. He just wanted to confirm what he heard. He was also injured and there was blood all over his face clothes. Quen Yoo didn't welcome him and shout, the episode ends here. This episode was much more better than the previous two as the story moves further. Hae So always out of the palace and got in trouble. 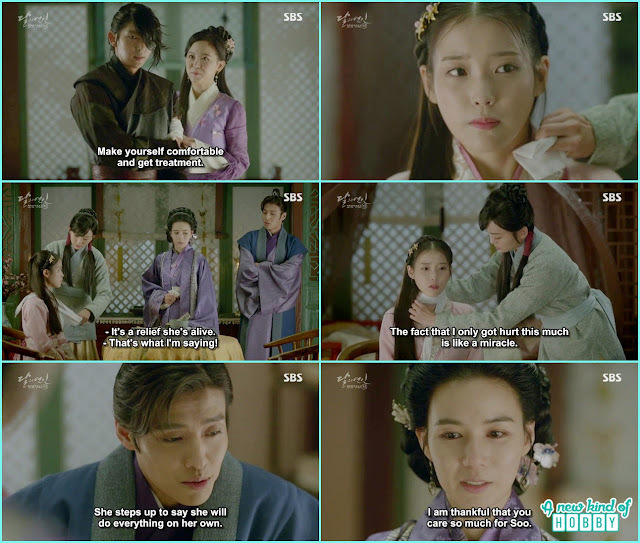 The 8th Prince Wang Woo every times saves her, he cares her a lot but it wasn't only just a care he sees her as a women and was interested in her. 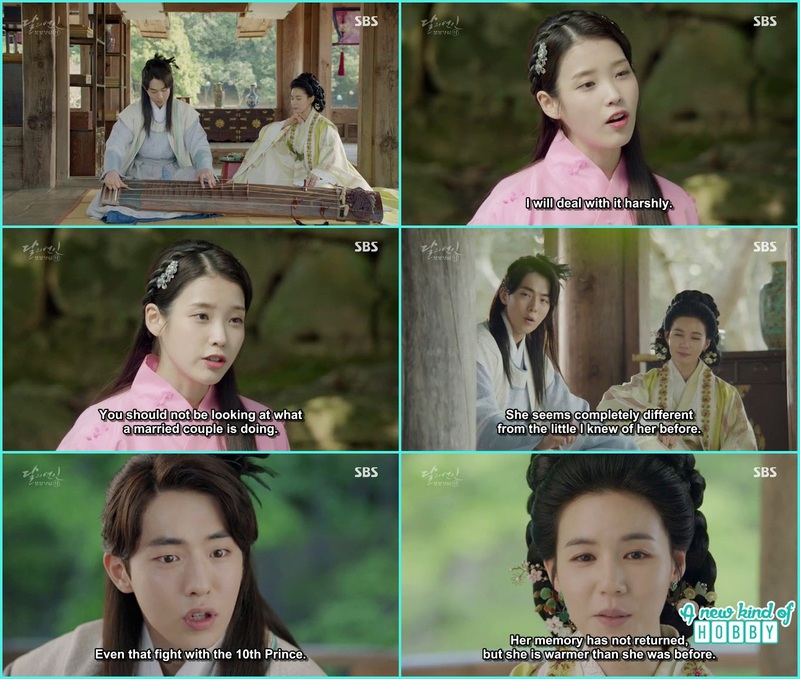 The 10th Prince Wang Eun become friends with Hae So after got beaten by her and now he has fallen for her charms. We come to knew the details of the characters and what motive that have. It was an interesting theory about Hae So body taken over by another spirit and it was from the modern world who is bold and had guts to talk back to any body over unjust. Thought she had the fear from the 4th Prince but still she didn't hesitate what she wanted to. We were also curious why Queen Yo hate the 4th Prince Wang Soo so much and why he sent away him to Shinju household. Other than this the conspiracy preparator was revealed. It was Queen Yoo the 4th princes cared for Queen Yoo and didn't want to get her in trouble so he killed all the people at the temple. Although he was abandoned and only receive hatred but he had a soft heart.